Add as many categories as you like and organize your dreams in your personal style. Keep track of your lucid dreams easily by simply turning on the lucid switch. 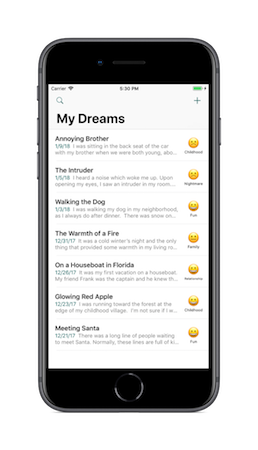 Select an Emoji to represent negative, neutral, and positive moods of your dreams. For those moments when you don't want to write down your dream or pay attention to voice recognition. Search and filter by lucidity and category to quickly find a specific dream. Send your dream easily via email or share them with other apps and social media.